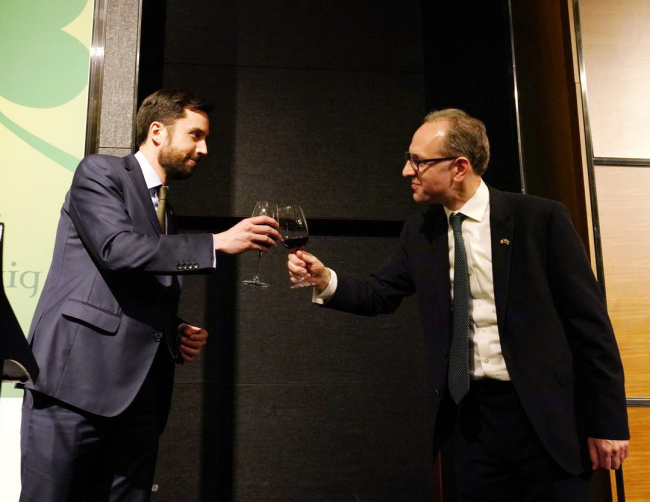 Eoghan Murphy, Irish minister for housing, planning and local government, visited Korea last week to promote Ireland as an attractive investment destination and important trade partner, coinciding with St. Patrick’s Day celebrations. “My government is committed to building a stronger and more vibrant relationship with the Asian region and Korea is a key partner for us,” he said at a reception in Seoul on March 13, in front of some 200 guests. Murphy’s visit is the third ministerial visit from Ireland to Korea over the last six months. Murphy met with Korean vice minister of land, infrastructure and transport, Son Byeong-suk, Vice Mayor of Seoul Yoon Joon-byeong, members of the Irish-Korean Business Network and Korean corporate executives of major firms. Every year around St. Patrick’s Day on March 17, Ireland’s prime minister and government ministers travel around the world to meet with Irish diaspora and strengthen ties with key countries. Before Murphy’s arrival, there were two ministerial trade missions representing agriculture and education to Korea late last year. Murphy also laid a wreath at the Irish monument at the War Memorial of Korea, commemorating Ireland’s contribution to and sacrifices in the 1950-1953 Korean War. “Having researched the security challenges of the Korean Peninsula for my post-graduate thesis and worked in the area of disarmament at the United Nations, I had long been interested in visiting the Demilitarized Zone and was very glad to have to opportunity to do so,” he said. Pointing out that Ireland remains a committed member of the European Union, the politician said his country has benefitted enormously from the membership. The fact that a senior government minister came to Korea underlines the importance Ireland attaches to its relationship with Korea, the envoy said.